We have long been firm believers in giving back to the communities in which we live and work and do so routinely. That’s why, when our good friends at Adolfson & Peterson Construction asked us to help with their Back 2 School Bounty program, we jumped at the chance. Back 2 School Bounty provides boxes chock full of supplies to schools and teachers, providing valuable resources for K-12 education and helping teachers do their job without having to worry about out of pocket expenses. Boxes contain everything from markers and glue to coffee gift cards and hand sanitizer. Doorways quickly became a “Bounty Box Advocate”, the highest level of sponsorship possible for the program. 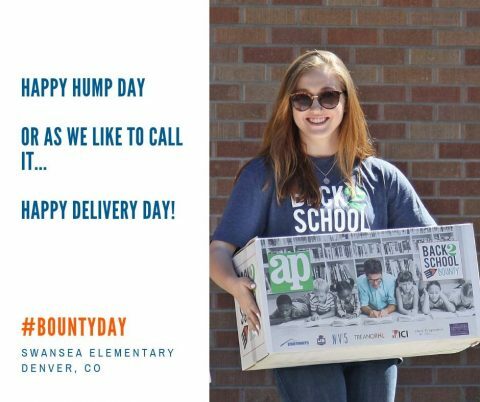 Yesterday, we were very excited to learn that every single teacher at Swansea Elementary in the Denver Public Schools district received a bounty box! It is said a teacher takes a hand, opens a mind and touches a heart. We could not agree more with that sentiment and are happy to have helped these teachers accomplish that.